It is 1946: the war is over and three young women face a new kind of life. But peacetime brings its own pressures . . . Katie O'Neill's childhood has been dominated by her temperamental mother and by frightening secrets that she barely understands. Innocent, yet hungry for love, she is easily taken in by male charm and is left outcast and alone with her young son. Emma Brown has spent the war at home in Birmingham, longing for her husband Norm to return and meet the son he has never seen. But she soon finds that the joy of homecoming only brings a whole new set of problems. And Molly Fox, after a sad and brutal childhood, found a place to belong during the war, in the women's army, the ATS. Now, the women are no longer wanted and Molly finds peacetime a bleak, difficult challenge. Finding work in guesthouses and holiday camps, she keeps running from herself, in search of a place she can call home. 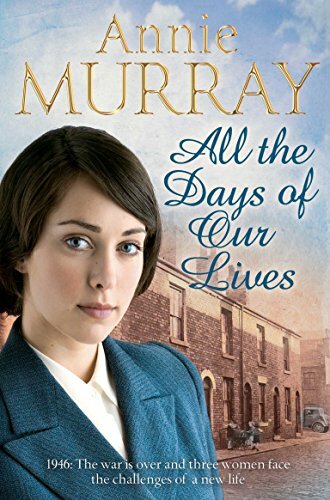 All the Days of Our Lives by Annie Murray is the story of three girls who first met in a Birmingham classroom in the 1930s, each facing life with all its joys, sorrows and surprises. Annie Murray was born in Berkshire and read English at St John's College, Oxford. Her first 'Birmingham' novel, Birmingham Rose, hit The Times bestseller list when it was published in 1995. She has subsequently written many other successful novels, including A Hopscotch Summer, Soldier Girl and the bestselling Chocolate Girls. Annie has four children and lives near Reading.